Following a 'three-strikes-and-your-out' principle, Newton Road station had three incarnations before its then masters, the LMS, decided that post World War 2 it was not worth keeping on as a going concern. 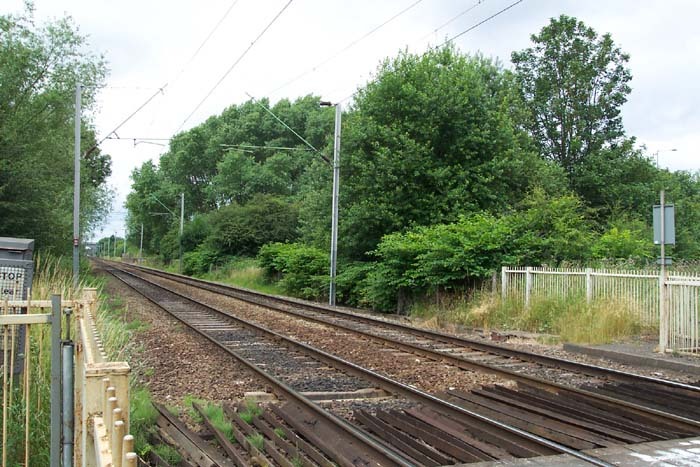 As one of the original Grand Junction Railway stations, Newton Road opened in 1837 but under LNWR control, it was deemed that a more suitable site should be found and the station shifted location a short distance along the track in 1863 to the junction of Ray Hall Lane with the railway. However, this move yielded few dividends in passenger numbers so the station was shifted back to its near original position on Newton Road in 1902 where it stayed until final closure in 1945. For this study, we are visiting the site of the second icarnation of the station as the site off Newton Road has been completely ploughed flat and Newton Road itself has been turned into a dual carriageway on an embankment and its path realigned thus to pinpoint the exact spot of the old station would be difficult and, in terms of what it would yield, pointless. Above we are on Ray Hall Lane looking to the site of a previous level crossing, immediately to the right of which stood the station. Ray Hall Lane is now truncated as a roadway and serves merely as a pathway under the M5 but at the railway, a gated and warning-light controlled barrow-crossing exists. 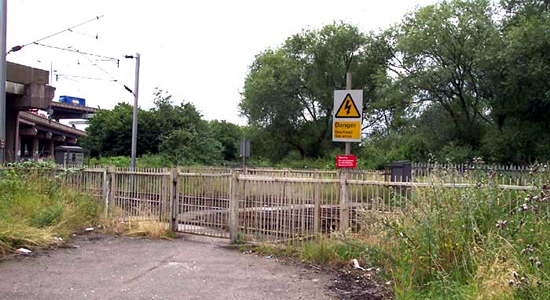 Above-left we have walked into the enclosure created by the two-gate system perated to enable access to the crossing and are looking at the station site in the direction of Walsall. 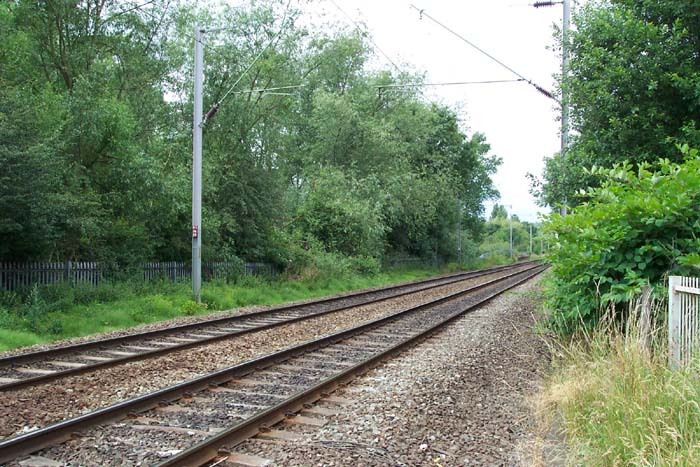 The Birmingham platform would have stood to the right of the track beginning immediately ahead of this spot. 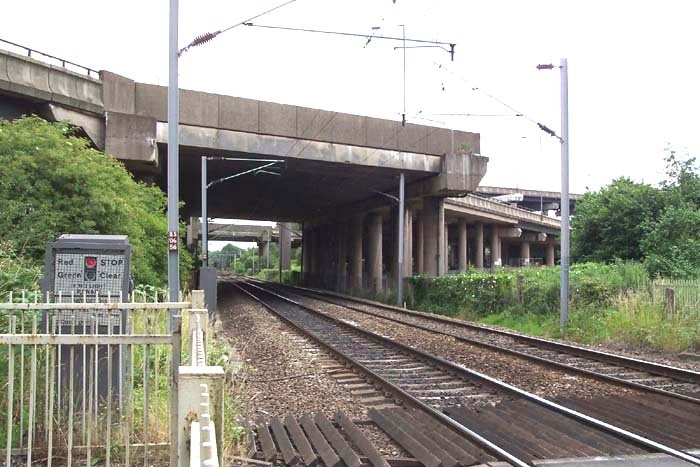 Above-right we are in the same spot but looking towards the site of the original, and third, incarnations of Newton Road station through the two flyovers carrying the M5: the bridge carrying Newton Road itself can just be discerned in the distance in the enlarged photograph. Above-left we have crossed the tracks and are looking back at the crossing gates on the Birmingham side and beyond them Ray Hall Lane. Above-right we are in the same spot but have turned slightly to our left to look at the spot once occupied by the station and the Birmingham platform, nothing of which appears to remain today (despite a rummage through the undergrowth). However, there is a possibility that the station platforms were of wooden construction and, as such, could easily have been removed without leaving a trace. Above-left we are again on the Walsall side of the crossing looking back towards Birmingham. Above-right I though I'd include a shot of the warning system that enables safe operation of the crossing. A red light for train coming and a green for all clear are signalled by the grey box beyond the railings. 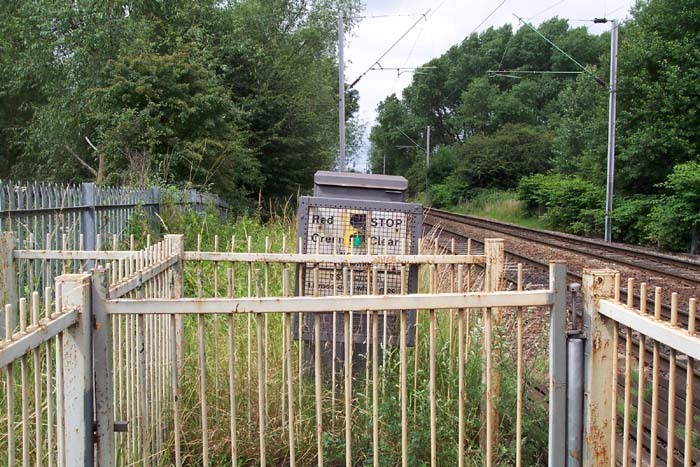 I thought this was quite an unusual piece of equipment and have not come across it before in the region - but maybe you can tell me where there are others as my 'expertise' does not extend to signal controlled barrow-crossings! This was an intersting site and I had a good walk around its perimeter and there was strong evidence of some recent remoulding of the land behind the track-lining trees on the Walsall side that would have further compunded the problem of trying to find some evidence of the station once having been here.